​A successful example of one of Lionel’s early experiments in direct seeding of acorns can be found at the photography studio of Colleen Rosenthal on the outskirts of San Luis Obispo. Following the tried and true method of the wildlife, Lionel, Colleen and friends dug small holes, around her home, putting several acorns into each. A drip system provided water only a couple times during the hot season for the first few years and then was removed. The trees have now grown to over 20 feet in height and are producing abundant acorns of their own. 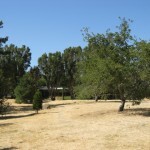 With very little labor, time, or resources, Colleen’s yard was transformed into an oak woodland, with a selection of Canyon, Cork, Valley, and Coast Live oaks on proud display. Overall, the trees serve as a windbreak around the home and driveway, as well as provide shade, wildlife habitat, and a privacy screen.